Fallout: New Vegas will include a gambling minigame called "Caravan," which is a form of head-to-head blackjack. Bethesda's released the rules of the game, which you can play with a standard deck. And for caps, if you like. IGN has the full set of rules. Summarized, Caravan requires two standard decks of 52 to play, and the objective is to build sets of cards with combined values between 21 and 26. 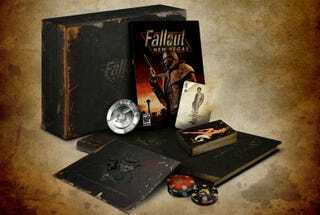 A special deck depicting the factions of Fallout: New Vegas will be a part of the game's collector's edition when it releases Oct. 22. For purposes of playing cards, it's the same as any other deck, so you don't have to wait for that to arrive. Hit the link to get a head start on your Caravan strategy. It may come in handy.